Introduced in late 2011, the 18-Mpix EOS-1D X was a direct replacement for the 16-Mpix APS-H format EOS-1D Mk IV, and somewhat surprisingly, was the first full-frame model from Canon aimed at sports and press photographers. It maintains the familiar design and control placement of the EOS-1D models but allows continuous shooting at up to 12 fps and has a completely new AF system. 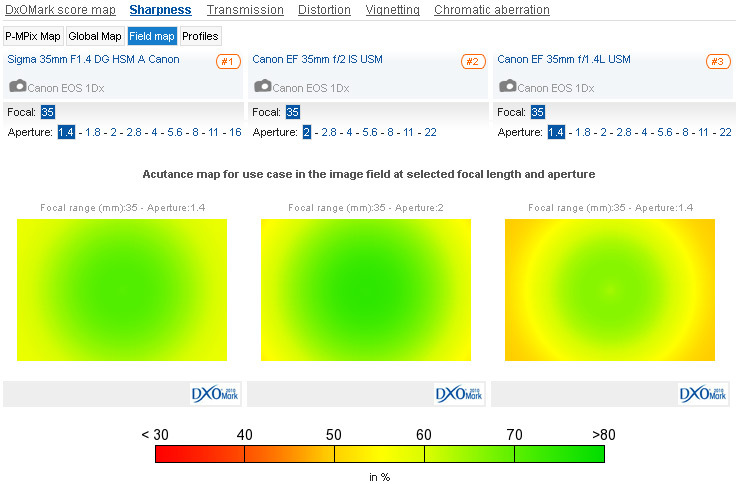 Although the Canon EOS 5D Mk III shares a similar 61 point AF module (with 41-cross type sensors) it lacks the power of an additional Digic 4 processor linking it to the RGB AE sensor in the viewfinder of the EOS-1D X to provide additional subject tracking. Other professional level features include a large, high magnification viewfinder with approximately 100-percent coverage, 30 sec – 1/8000 sec shutter speed range with 1/250th X-sync, WiFi terminal and built-in RJ-45 (gigabyte ethernet) port and a weather sealed body. The EOS-1 D X also features extensive video features including 1920×1080 (30, 25, 24 fps) capture with a choice of recording formats, and has a powerful battery capable of 1020 shots per charge. We’ve put the camera through its paces with over 130 different lens models from both Canon and third-party makers, ranging from the uniquely wide Canon EF 14mm f2.8L II through to the new yet equally extreme Zeiss Otus 1,4/55 and on up to the new and full-frame EF 600mm f/4 IS II USM and EF 200-400mm f/4 IS USM Extender 1.4x models. Zeiss has seen extraordinary success with their new Distagon-type T* Otus 1,4/55 and it performs exceptionally well on the Canon EOS-1D X. It’s rare to see an ultra-high speed lens like this that’s sharp out to the corners at the initial aperture – even Sigma’s highly regarded autofocus Art-line 50mm f1.4 DG HSM ranked in joint third place can’t match it – not at least till f2. It’s the best performer of all the EF mount lenses that we’ve seen. Peak sharpness is very good indeed but the Zeiss Apo Sonnar T* 2/135 is marginally sharper across the field at f2.8-5.6, and accounts for the maximum 18P-Mpix score. In joint third place with the Sigma Art line 50mm is the firm’s 85mm f1.4 EX DG HSM. Both models perform to a similar level and at $949-969 are considerably more affordable than the Zeiss pair. Sigma’s Art line 35mm f1.4 comes in fourth place, narrowly behind the 50mm but several places in front of Canon’s aging but still widely respected 35mm f1.4L in joint 7th place. Canon’s recently revamped stabilized 35mm f2 and film-era 100mm f2 achieve good scores at reasonable prices and the maker’s legendary 135mm f2L, 85mm f1.2L and 24mm f1.4L all perform exceptionally well, and have similar peak sharpness levels to the best performers, though they don’t have the uniformity at and close to the initial aperture. Although designed for digital bodies, the Canon 50mm f1.2L is the oldest of the ultra-high speed 50mm models and with just 8 elements against the Zeiss’ 12 and the Sigma’s 13 elements it doesn’t test particularly well compared to the newcomers. Don’t let that put you off though as it has a very attractive drawing style, even if it has quite high levels of CA and can’t quite match the sharpness of the Otus 1,4/55 and the new Sigma 50mm f1.4 and wider and mid-apertures. Stopped down the Canon performs very well in terms of sharpness, but peak levels are some way behind the newer models. 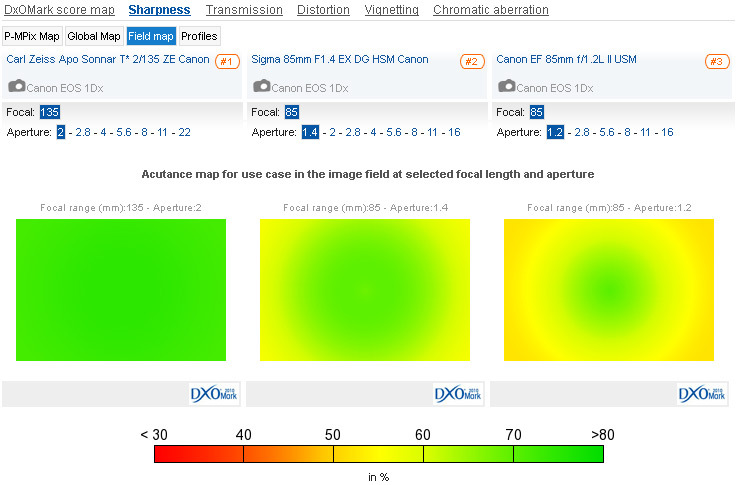 Both the Zeiss and Sigma excel throughout the aperture range, particularly at and close to the initial aperture. Although the Samyang achieves the DxOMark score as the Canon EF 24mm f1.4L for its overall optical quality the Canon is sharper from the initial aperture and it’s superbly corrected for distortion which has added to the price substantially. And lets not forget the Canon has autofocus and meters at full aperture, whereas you have to meter with the lens stopped down with the Samyang, in EF mount at least. Still the two models are impressive overall. The stabilized Canon EF 24mm f2.8 IS USM has similar peak sharpness levels as the L-series model and is lighter, smaller and more accessibly priced though obviously that comes at the expensive of ‘brightness’ – nevertheless the built-in stabilizer will appeal to both stills and video users. 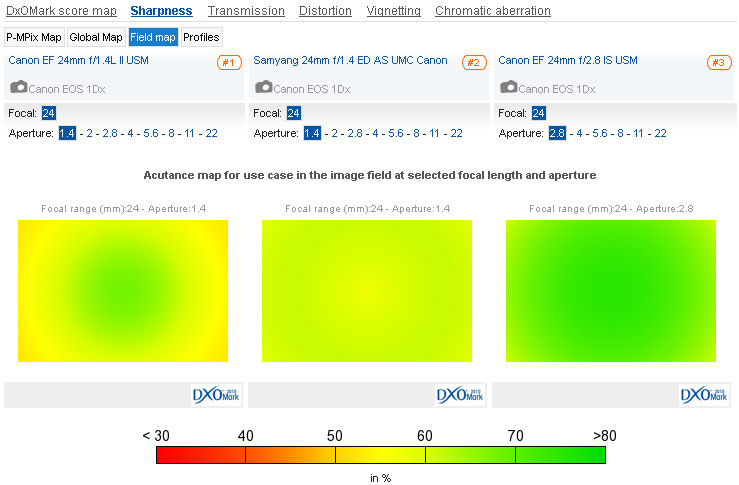 Full aperture performance is impressive with all three models. 35mm wide-angle lenses remain popular, and Sigma’s new Art-line model is the best performer but it’s perhaps not so acutely obvious in the test results on the EOS-1D X. Both the new stabilized 35mm f2 and film-era 35mm f1.4L still perform very well indeed. 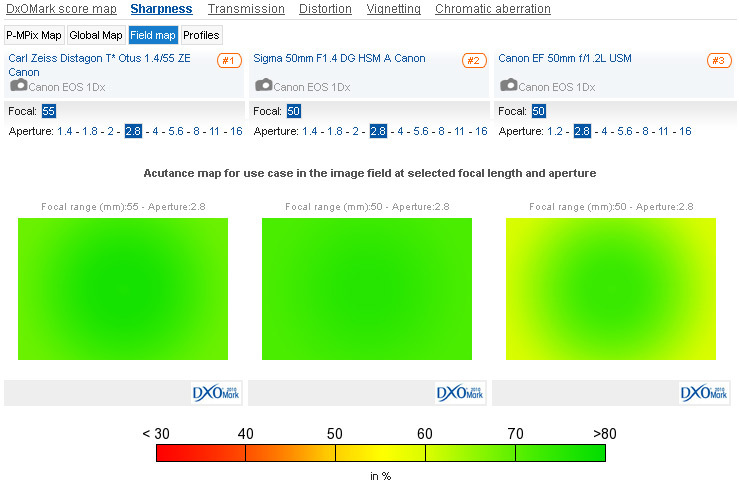 The revamped f2 model even has the same measured peak sharpness as the Sigma. Both models draw slightly differently, but the appeal is subjective – neither are likely to disappoint in sharpness or uniformity. The older f1.4 model has a unique drawing still even if the peak sharpness can’t quite match that the newer designs. 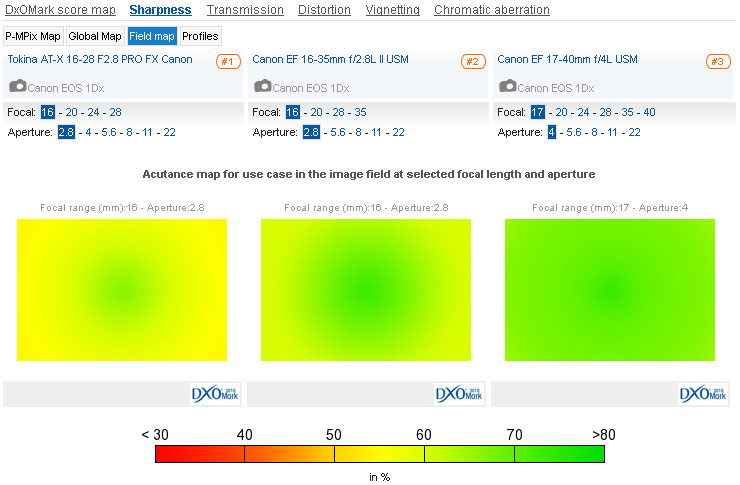 It also has high levels of chromatic aberration, but in truth all three are solid performers. 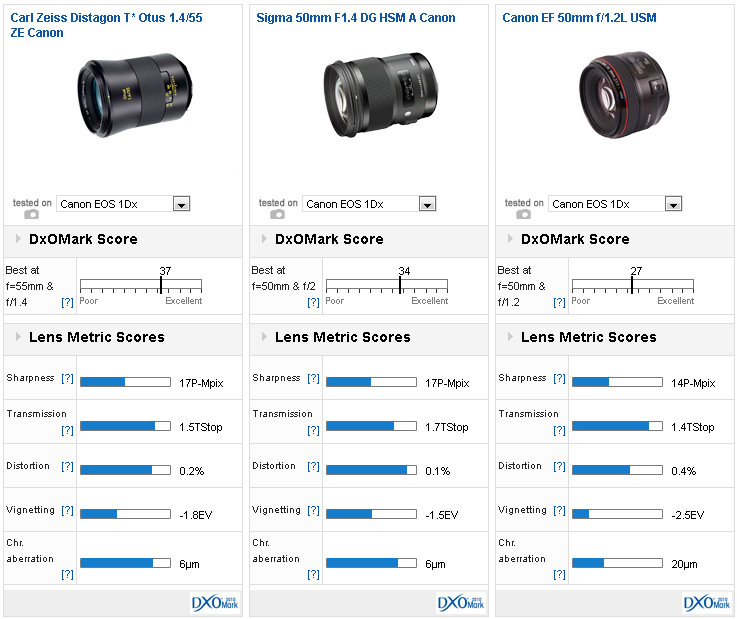 Although the Sigma is the best 35mm optically, the two current Canon models aren’t far behind. Without doubt the best performing short telephoto is the Zeiss Apo Sonnar T* 2/135 with a DxOMark score of 33 points and an outstanding peak sharpness of 18P-Mpix. Optimum performance is at f2.8-4, but this lens is phenomenally sharp at full-aperture. The only negative point, apart from the price, is the lack of autofocus and that is arguable. Canon users have a extremely wide range of options though, including the EF 135mm f2.0L which has blazingly fast AF and is no slouch optically. 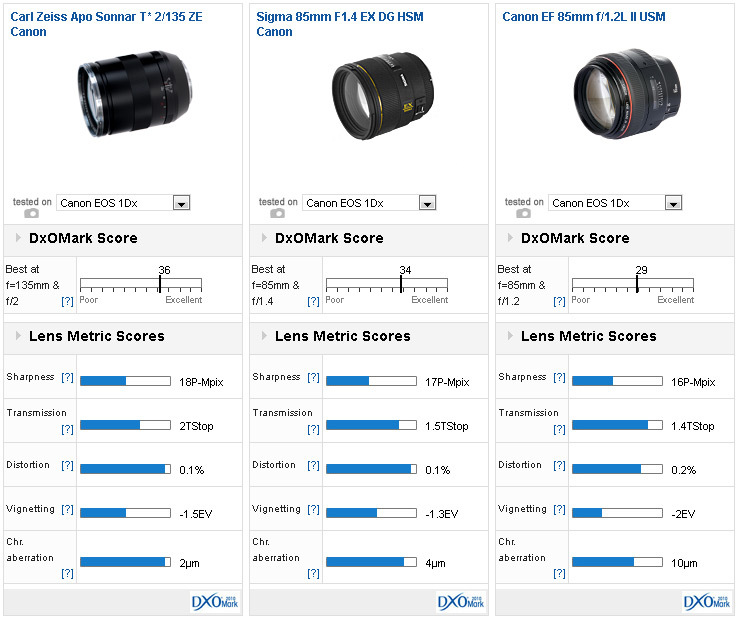 We’ve included the Sigma 85mm f1.4 in this comparison for its high DxOMark score and is one of the best performing models of any focal length. In overall performance it’s not far behind the Zeiss 2/135 and is a far better performer than the equivalent Zeiss 1,4/85 offering –particularly at full aperture where the latter is rather weak. Canon’s own EF 100mm f2 is a solid performer, but at this level the EF 85mm f1.2L II is more in keeping – it has similar sharpness to the Sigma at full aperture, which is no mean feat at f1.2, although peak performance is achieved at f5.6. The Zeiss is outstanding at full aperture but both the Sigma and Canon perform excedingin well. 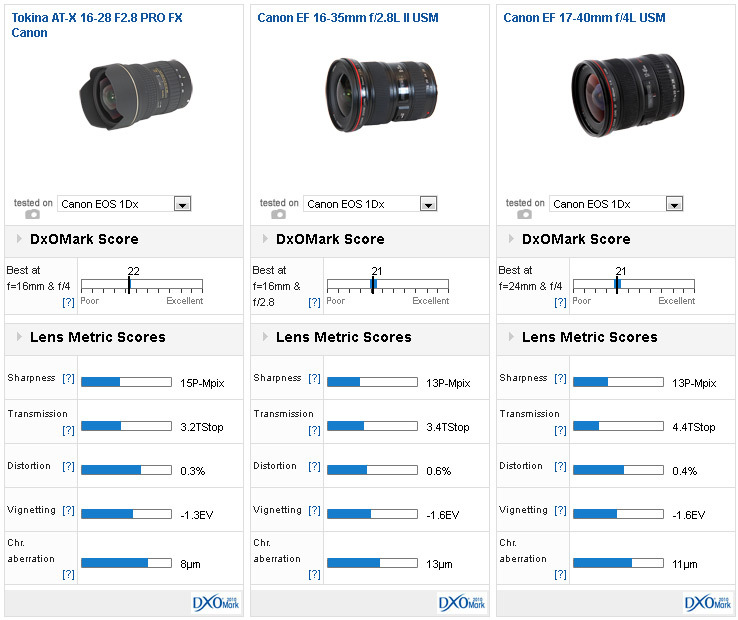 The best performing zoom lens on the Canon EOS-1D X in our database is the recently revamped Sigma 120-300mm f2.8 DG OSM HSM S with a DxOMark lens score of 28 and peak sharpness of 16P-Mpix – though bear in mind optimum performance is at the shorter end and so the score isn’t directly comparable to the new Canon 300mm f2.8 model at 18P-Mpix. In second place is Tamron’s new stabilized SP-70-200mm f2.8 Di VC USD. At $1699 it’s considerably less pricey than the latest Canon EF 70-200mm f2.8L model which saw an increase in build and durability along with the addition of fluorite in the optical formula. That is ranked in joint third place with the firm’s revised 24-70mm f2.8L II USM. Although a high watermark in standard zooms (the best performer of its type) the Tamron SP 24-70mm f2.8 Di VC USD is very good optically, even if it can’t quite match the Canon for uniformity. While the choice of wide-angle zoom models is a bit limited Canon users can boast of two good L-series models and the often over-looked Tokina AT-X 16-28 f2.8 Pro FX. 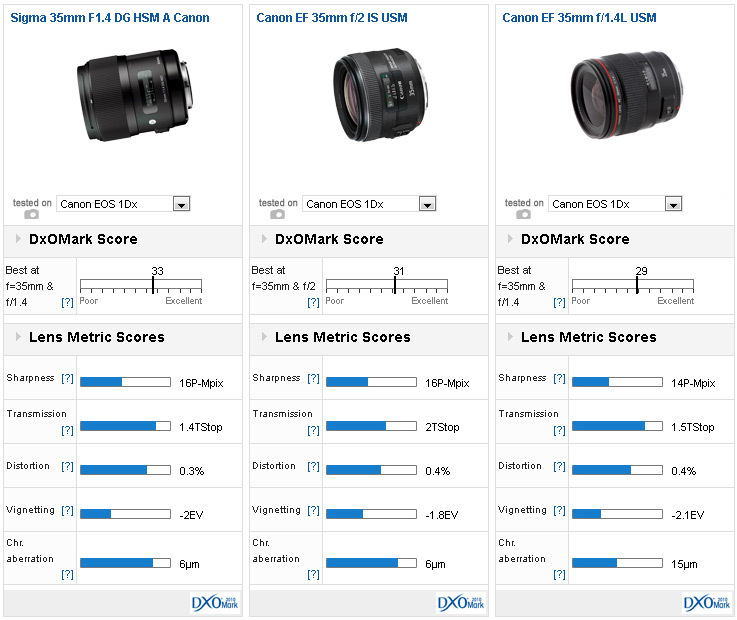 Although a big heavy lens and with a somewhat limited range it is a good performer – indeed it’s the best wide-zoom in our database on the EOS-1DX, albeit by a narrow margin. Despite being the most modern of the three performance at full-aperture is a little lack-lustre at the wider-end. In contrast it’s the wider-end where the two Canon models perform strongest, although they perform well when stopped down at least centrally, the edges are weak at most apertures – the 16-35mm f2.8L II more so than the 17-40mm. Performance at the shorter focal lengths can’t quite match the two Canon models, but overall the Tokina is the best optically of three albeit only just. 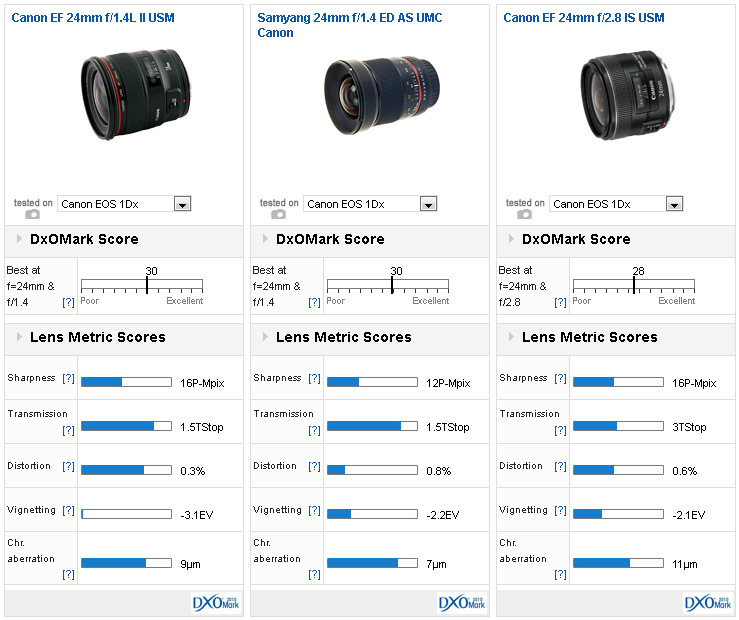 In part II we’ll be looking at the best performing lenses for sports and action on the EOS-1DX. 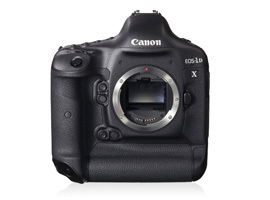 If you have a Canon EOS-1D X and a favorite lens, we would very much like to hear from you. Please leave a comment below, stating what lens it is and why you like it.